From time to time mistakes will happen but this time the result is good news! We just received a shipment of 1/8 in. Spectra Blue® PVC that is not the right color. 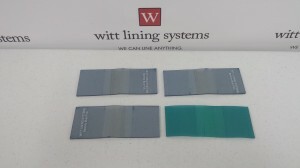 The color tint in the material is nothing more than a toner that is added during the extrusion process. In this case, the incorrect toner was added in. The material is the same material formulation as the Spectra Blue and the material carries all the same physical properties, chemical resistance, temperature resistance and so on. The only difference is that this material is more greenish in appearance than what our Spectra Blue PVC normally is. From the extruder’s point of view they could re-grind the material and use it for something else (our materials are never made from re-ground PVC) but instead they have given us a discount on the material. We are calling it Spectra Blue Off Color and passing that discount right on to you. Obviously supplies of this material are limited and we are offering it on a first come first served basis. If you can live with the color order now and save a little money on your next drop in liner!! !